Writing essays is my forté, yet writing to a prompt is a complicated task. As I think about my professional life, I probably spent more time writing than almost any other single activity either writing essays myself or grading students’ and teachers’ essays for over 20 years. Writing professionals have boiled essay writing down to a few steps which can be easily explained to someone who doesn’t write. While most people THINK they know how to write if they can put words down on paper, it has been a shock to me to realize how many people struggle to write even a simple five paragraph essay to answer a prompt. Essays usually convey information rather than to tell a story, although they may use facts to persuade or convince readers to take action as well. New writers need to know that an essay consists of only three parts: an opening paragraph, the body, and the conclusion. Simply outlined, the opening paragraph restates the prompt stating three or more examples or facts. The next three paragraphs expand on the three or four facts stated in the opening paragraph. The concluding paragraph points back to the opening paragraph and summarizes how the paragraph addressed the stated prompt. These steps sound simple enough. However, often the writer is asked to write to a prompt about which the writer has to search the depth of his memories to create a coherent response. Other times the writer must research the topic to write an intelligent essay. Notice that the first thing that I did to prepare for THIS essay was analyze the prompt or break it into pieces. I didn’t just start writing. I asked myself questions such as, “Of all the complicated things I CAN do, what ONE thing can I do WELL? Of those possibilities, what can I write about in a few paragraphs?” Next the prompt asks me to explain it to a friend, so I asked myself, “Who is my audience?” Before I write anything I take a few minutes to ask myself questions about the prompt. I usually jot down some notes in an informal list or outline. In this case I also began with both a quotation and a definition or explanation of my topic. Writing to a prompt is complicated for many reasons. An author who does not know much about the topic may cut corners and merely copy the prompt word for word, and preface it with the words, “Today I am going to write about…” This might be acceptable in first grade, but beyond that writers need to display more sophistication in their writing. It would be better to start with a quote or a definition instead. On the other hand if the author has too much information about a topic, writing becomes complicated. In this case writing can take many turns and twists because, according to the brain laboratory at UCLA, people have more than 70,000 thoughts per day. One short essay can’t utilize all these thoughts, so the first step is deciding which thoughts are keepers. When writers struggle with this, the result is that their writing is unclear. 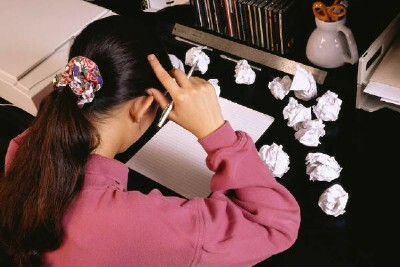 That is the reason if I am writing under pressure on a topic I begin with brainstorming, then move to an outline. I may do this in my head, but it is more effective if I write it out. Finally writing to a prompt is a formal process. Vocabulary and style become issues. My blogging style is rather informal, uses simple vocabulary and sentence structure, and is often funny. My formal writing style as I would use in a writing prompt, differs from that in several ways. I use a more academic lexicon or vocabulary, and vary my sentence structure, and I am usually more serious. Each sentence starts with different words. For example, after I have written this essay, I will go back over it and circle all the initial words. If I have more than two of the same beginning word, I will change one of them. I will look at how many of the same words I use within the sentence as well. I word processing programs as well as the internet have dictionaries and a thesaurus at the writer’s fingertips, so there is no excuse for repeating the same word multiple times. Once I have thought out my topic, analyzed the prompt, brainstormed facts, organized the facts into similar paragraphs I started the actual writing process. Next I wrote a clear and concise opening paragraph. Following in next three or four paragraphs I developed the topic. Finally I closed the essay with a summarization. After writing I checked to make sure that I didn’t repeat myself or use all the same type of sentences. I proofread my piece one last time before considering it complete. If you do these simple steps, you will have a passable essay for any exam, or job application. Although a writer may not be a best selling author, he or she can follow some simple steps to become an expert in writing to a prompt. Very practical tips you put together. Thank you so much, Marsha! I’ll read more from the links you provide. Happy weekend! I used this same prompt for the blog entry I’ll be posting tomorrow, but with nowhere near the dignity and intelligence you did. 🙂 But I have written plenty of essays in my time, and I agree with your wonderful post. Thank you for that compliment. I LOVE your writing style. I’m anxious to see your answer. I’ll be watching for it. Right out of college I was a dental assistant for a while. That was as medical as I ever got. I came close to fainting every time the patient bled. That wasn’t a good characteristic for a medical assistant of any kind!! My problem is, when it comes to writing prompts, I tend to be very succinct in my answers – a 3 paragraph essay never went over well in high school, unfortunately! On the other hand, given a more broad topic range, and I become overly verbose 😛 Very good tips, and nicely written! Thanks for sharing, Marsha! Good point. I was thinking more about test taking ie tests that teacher’s aides have to take in California to get a job, or writing to a prompt on a timed entrance test. I should have included the word TIMED on here because you are right, for higher education than elementary, 3-5 paragraphs don’t make it. I think that’s why the brainstorming time is so important. What I read when grading those prompts often is a repeat of one or two sentences over and over. Instead I wish the writer would take time to list out what he or she actually knows about the subject. Maybe ask some questions of themselves. Even if the person doesn’t do a complete outline, it expands their thinking so they don’t have flash frozen brain cells. That’s what I have when I am speaking about a subject I know little about.